Details of these events will be provided in Events and Newsletter. Volunteers are needed for all events. A weekend with families and friends to relax and play together at our beautiful mountain camp! Heated cabins, hot showers, and great food at Camp DeBenneville Pines, located in the San Gorgonio Mountains. Meet other UUCLB families, hike to the lake, play games in the lodge, or relax by the fire. Do not miss this weekend! Join our UUCLB community as we celebrate St. Patrick’s Day! Listen to music, dance, and listen to and tell jokes. Delicious snacks and libations served. The Seder is an important part of our Unitarian Universalist heritage, celebrating the liberation of the Israelites from slavery in Egypt. In our celebration, we also recognize our UU commitment to the cause of freedom for all people. Furthermore, it’s a party, a feast full of joy and family fun, which thrives on the full participation of many people. 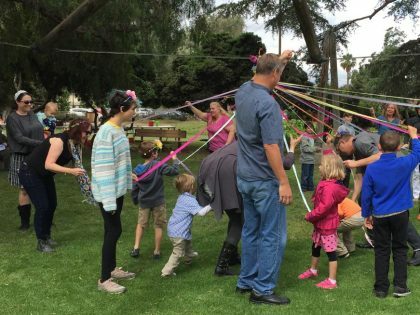 Bring your family to welcome the start of Summer with music, crafts, maypole dancing, and rejoicing in the circle of life. UUCLB has a long standing tradition of showing support for the LGBTQ community by marching in the Long Beach Pride Parade. All family members are invited for this fun and exciting event! Picnics are held on select Wednesday evenings in the Summer. Bring your own main dish and a potluck dish to share. Enjoy a beautiful summer evening of food and conversation on our campus. This is a great way to get to know other members and friends in a casual setting. Ghouls and boys will have a hauntingly good time at our all-church party which traditionally includes crafts, games, a costume parade, and a haunted house sponsored by our Middle School group. Our Church’s biggest fundraiser of the year. An evening of fun, cutthroat bidding on dinners, artwork, events, special services, and more. Food, entertainment, and door prizes round out a thoroughly enjoyable evening of community and celebration. Come and join the fun! Bring yourself and your family to UUCLB for tree trimming, ornament making, cookie baking and decorating, and Wylder Hall decorating. Drinks and snacks will be served. Nature’s Path Group explores Wiccan and Pagan practices and insights as well as celebrating all of the Wiccan Sabbats. These events are to be announced and all are welcome.